As dog owners, our lives tend to revolve around our fur babies. Being a dog parent is quite similar to being a parent to child in that they need to be constantly cared for, kept company, fed, bathed, and kept safe and healthy. But unlike children, it is often more difficult to take our dogs with us on trips and outings. For one, traveling by air with your dog is quite the process: you must have a specific certificate from your veterinarian clearing them for travel, they must be up-to-date on all of their vaccines (as they should be anyways), and transporting your dog via plane is incredibly expensive. But there are other options for your dog when you have a trip or event, one of them being dog boarding. As the premier animal hospital and pet resort in the Northland area, we at Eagle Animal Hospital offer our Kansas City residents with exceptional dog boarding services at our state-of-the-art facility. Below are some reasons why our dog-owning residents should consider reserving a spot for their dog(s) in our pet resort. If you have an upcoming trip and don’t have a friend or family member who can stay with your pup, your best option is to bring them to stay with us in our immaculate dog boarding facility. While going on a road trip with your dog is much easier than flying with them, some dogs don’t do well riding in cars for long periods of time. Secondly, you’ll have to make sure that the hotel or motel you’ll be staying in is pet-friendly, which isn’t always the case. Flying with your dog can cost upwards of hundreds of dollars, and using a pet transport service can be even pricier. 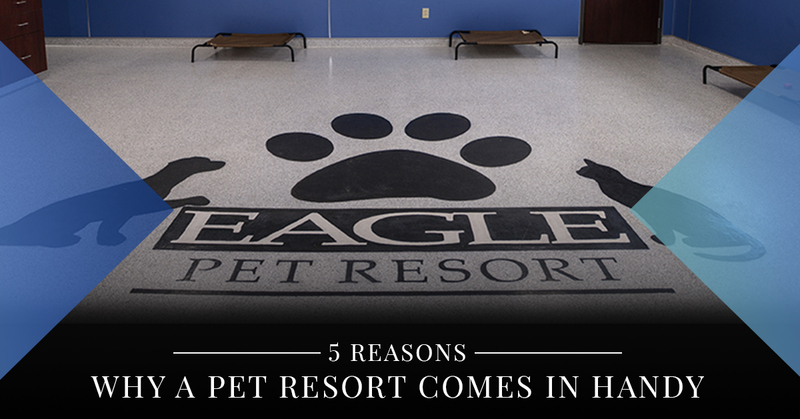 Instead, if you have a vacation on the horizon, call our animal care team to reserve a spot for your dog in our cozy pet resort. In the unfortunate case that you have a family emergency that you must attend to out-of-town (or even in-town, for that matter), pet boarding is a great option. While you attend to your emergency, we can take care of your dog for however long you need. This is helpful because while we care for your pup by feeding, walking, and playing with them, and, of course, giving them lots of TLC, you can focus on the important things you need to take care of. Placing your dog in the care of our caring, kind, and knowledgeable pet resort team will give you peace of mind in knowing your dog is in good hands while you attend to your emergency situation. Our jobs often take us on out-of-town business trips that are jam-packed with seminars, training events, luncheons, and more. While some dog parents may be able to bring their dogs along, business trip schedules leave very little downtime to attend to pets. In most cases, though, dog owners must make other arrangements for their dogs so they can attend the trip. Bringing them to stay with us in our dog boarding facility is a convenient option because they can stay with us whether it’s just for a long weekend or even longer. You can rest assured that your dog will be getting plenty of exercise, rest, and pets from our dog boarding staff while you’re away. Dog boarding also comes in handy when you’re moving. Sometimes, trying to pack up our household objects, move everything out of the old home and into a new one, and cleaning can be challenging when you have a dog in the house. What’s more, dogs tend to get anxious when there’s a lot going on, especially when things are extra chaotic during a move. Often times, it’s easier to have them stay in a pet resort for a day or two while you move everything and get somewhat settled into your new home. This can also reduce the risk of injury to your dog and to you in the case of dropping objects, tripping over your dog, or having them run out into the street when the door is left open to move things in or out of a home. If you have any of these scenarios in your future, give Eagle Animal Hospital and Pet Resort a call today to reserve a room for your pup. We have several dog suites, including luxury, deluxe, and studio suites, which are all temperature-controlled, and all have window views. Our animal care team will keep your dog cozy, comfortable, and safe during their stay, and you can even check in on them using the Snapchat app! Give us a call today to learn more or to reserve a suite in our Top Rated Local® Northland dog boarding facility.